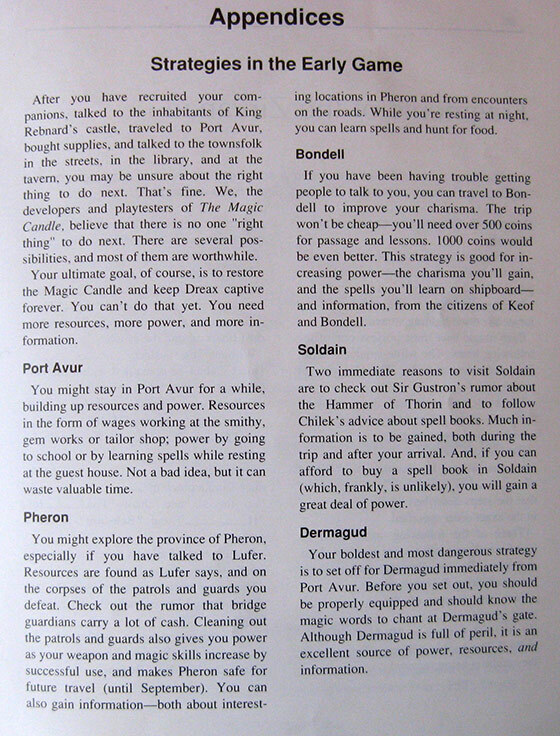 I realized I neglected to mention the game’s main quest/whole rationale in my first Magic Candle post. Here’s the gist of it. In the semi-distant past the Forces of Darkness’s favorite big badass, the archdemon Dreax, was poised to unleash some Sauron-like destruction on the world. Badass Dreax could not be killed, but he could be captured. A band of heroes died as demon-fodder to allow the mage Zirva close enough to Dreax to trap him within a candle’s flame. An ingenious use of magic, sure, but the candle was just an ordinary piddly candle, sure to burn away and release the demon again. So a giant candle was crafted in the fortress Berbezza, and Dreax was transferred to the Magic Candle’s flickering flame. A host of 44 Guardians of the Candle have the duty of chanting to keep the flame burning and thus keep grumpy Dreax trapped. Well, as the game starts, the Guardians of the Candle have gone missing, the Candle has begun to burn down, and lesser minions of the Forces of Darkness gleefully mill about the land, expectant of Dreax’s return. You have to prevent this return. Interestingly, the game allows you to set the difficulty level by choosing how many days you have before the Candle burns down. 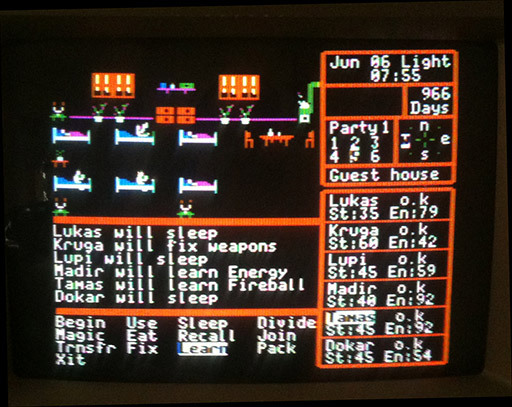 By all accounts, this is a pretty long game to complete, so I chose the Easy setting – 999 days – because I can’t imagine anything more annoying than having invested 50 hours in a 8-bit game and then seeing ‘oops – the Candle burns down. Game over’ pop-up. 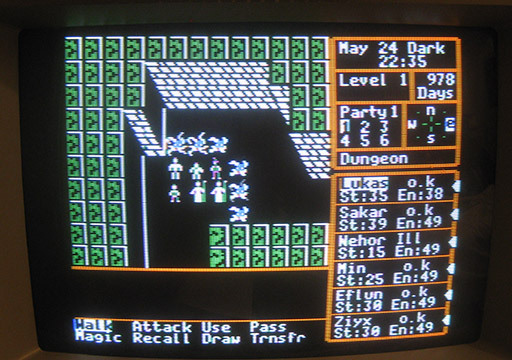 Even in my youthful Apple II days of almost unlimited free time, I don’t know if I would have started a game over after an event like that. I’m not saying I will actually get that far in this game, but if I do, I don’t want to be chopped off at the knees by a time limit. 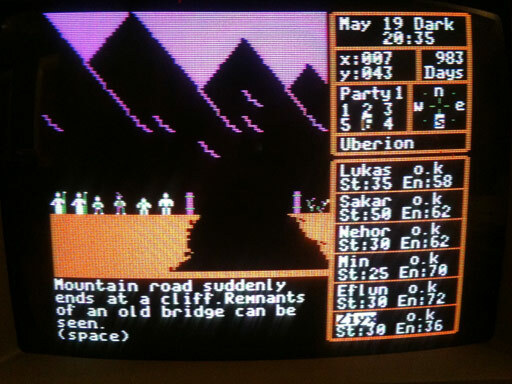 I wonder if any CRPG masochists of the day actually chose the Tough setting of 600 days? 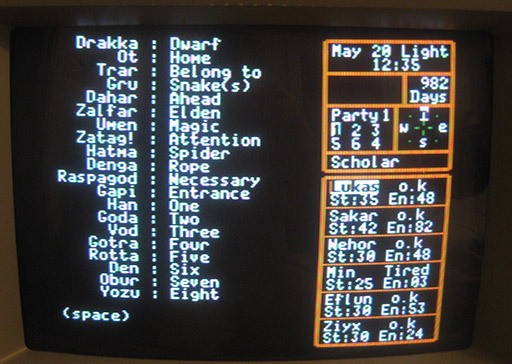 That gives you an idea of the options available even this early in the game. I have also been relying on additional staring guidance from Jason Spangler’s great Magic Candle page, as well as the Magic Candle entry in Shay Addams’ Quest for Clues III book (I have pledged to only look at the first of the five MC pages in that Quest for Clues book, unless I get *really* stuck at some point). Sleeping – this is handled in an interesting way. 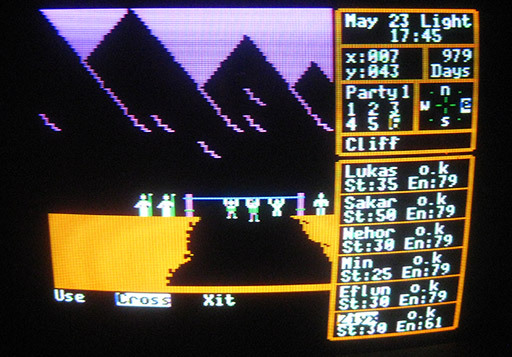 When a party sleeps in a hotel or makes camp in the overland map, you can choose what each character will do for that sleep period. Plain ol’ sleeping will restore energy, but you can keep some members awake to perform tasks. The most common of these is to have your mages memorize spells. Whenever a mage casts a spell, it first must be Recalled from the stack of pre-memorized spells. Learning spells is effectively stocking up on your spell-casting ammo. Another task is fixing weapons, as they wear down from combat use. Another possible duty is standing guard when you’re camping in the wild, because otherwise you may endure a surprise attack from wandering baddies. All this may sound annoying, but it actually makes what could be just perfunctory down-time instead a phase where you consider trade-offs – do you keep your mages up to learn more spells while everyone else sleeps? But they need to restore energy too. Do you have them pop some sermin mushrooms to make up for it then? You might need those ‘shrooms during combat. OK, let them sleep extra long — but that eats in to the game’s overall time limit, etc. Extra keywords – I initially thought the only conversation keywords you could ask NPCs were the ones obviously highlighted by quote marks in conversation. But it turns out some of them do respond to logical but non-quoted keywords from other bits of conversation they give (like the name of an NPC or town they mentioned). It’s cool that there’s more keywords (making it a bit more Ultima IV-like) but it’s unfortunately not consistent – sometimes (more often actually) they won’t respond to obvious words from sentences they’ve just uttered. It really would have been better to have consistently highlighted keywords, so you wouldn’t waste time guessing. 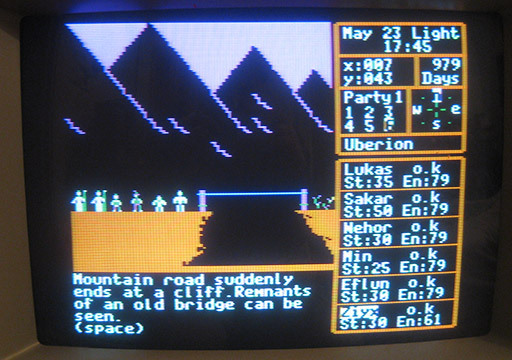 And if instructed to Cross, your party shimmies across it Lode Runner style, which is charming. 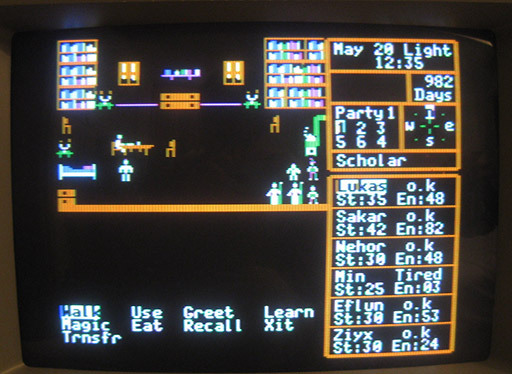 He taught me some dwarvish, which I thought would be treated as a behind-the-scenes skill I’d acquired, but instead involved several screens of dwarvish words and their meanings. More note-taking! It’s been hinted dwarvish messages needing translating will lie in some dungeons or mines. Speaking of dungeons, I’ve visited two, the first being Dermagud. Its doors could only be opened by a chant (yes, all Tolkien/Moria like – and it’s a mine) taught to me by an NPC. The cleric with the Resurrection spell was among the casualties, thus Lucas could not be resurrected, thus that was game over. I restored a save, rested more, made better tactical reactions in my re-match with the slimes, and was able to scramble off to the dungeon’s teleportation room before being attacked by anyone else. Teleportation rooms only work when you use the right 3-part sequence of spheres, cubes and/or pyramids – these all being items you can purchase from merchants wandering the overland roads. 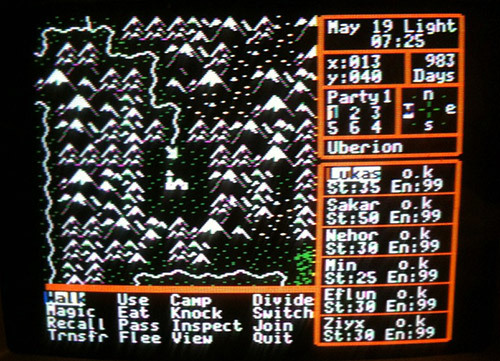 I teleported way over to the southeast corner of the continent, and was following Shay Addams’ advice of making a beeline for the Crystal Castle when all but 3 characters were slain on the way. This was less tragic that it might seem, as the Crystal Castle’s appeal is having some stronger characters you can swap into your party. I dismissed the remaining survivors and hired Addams’ suggestions. This new, tougher party was still not cut out for the general skill of the roaming badguys of that region, however, as I discovered when I tried to travel south to the city of Kharin. 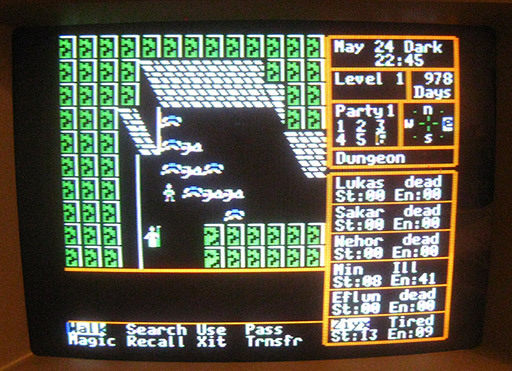 I could not make it, and returned to the Crystal Castle, which fortunately has its own dungeon with a teleportation room that takes you back to the area around the King’s Castle, where the party initially started out. There’s a number of leads to follow. From various conversations, I’ve learned that the Zirvand — instructions on how to re-seal Dreax — has been placed in a stone vault that can only be opened by a star-shaped key. A white wolf that lives by the ‘wolf rock’ in Phaleng carries this key around its neck, and can by lured by the rare plant hoyam. The dwarves of Soldain have hoyam, but are only going to let me at that good stuff if I prove worthy of being a ‘dwarf-friend’, which looks like will involve recovering Thorin’s hammer, which some jerk Orcs have buried in one of the dungeons. I’ve also been told there’s a god sleeping in each dungeon, and ‘two above ground’, all of whom must be prayed to and eventually, apparently, awoken. (If I get to wake some gods, I hope the game doesn’t just portray that with a single ‘The god X is now awake’ line.) The first thing I’m going to do, however, is sail to Bondell where I can get Lukas’ charisma raised, so I can pump info out of the cads who still won’t talk to us. I’m definitely interested in continuing The Magic Candle, despite some annoyances and some generic elements, there’s something compelling about it that makes me want to see more of its world. 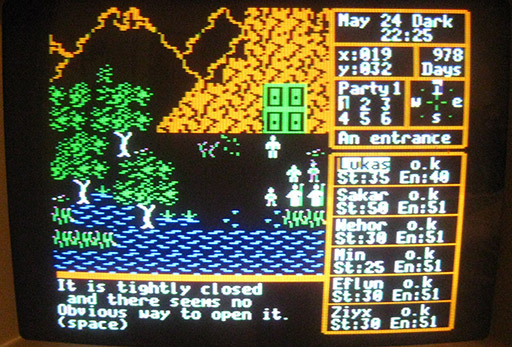 I do fear that combat could become tedious, as the variety of foes and especially the variety of spells available to you are less than Ultima IV, and it could end up being endless recombinations of the same-old. But I’m not at that point yet, and maybe the game has both foes and spells up its sleeve that aren’t detailed in the manual.